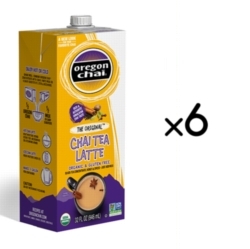 Oregon Chai's The Original Concentrate is the unadulterated taste of perfection. Made from pure natural ingredients. Contains 35mg of caffeine per serving. Refrigerate after opening. INGREDIENTS: Water, Organic Evaporated Cane Juice, Organic Black Tea, *Organic Vanilla, *Organic Spices, Organic Honey, Citric Acid, And Natural Flavors. (*Extracts).